We’ve become used over the last few years to our Internet Favourites and Bookmarks automatically synchronising between all the devices we use. It doesn’t matter which browser you use, synching is supported in them all in no small part because the major browser companies, Google Microsoft and Mozilla, want to lock you into using their browser on all your devices. If you use Microsoft’s Edge browser in Windows 10, or on the Android or iOS operating systems for which the browser is also available, and you sign into the browser or your PC using a Microsoft or Azure AD account, you can expect smooth syncing of favourites between all your devices. Sometimes though, problems can arise, either from accidentally deleting a Favourite you didn’t mean to, or due to a server or synching problem that can cause some long-help Favourites to disappear. This is where Edge Manager which can help with all these things. 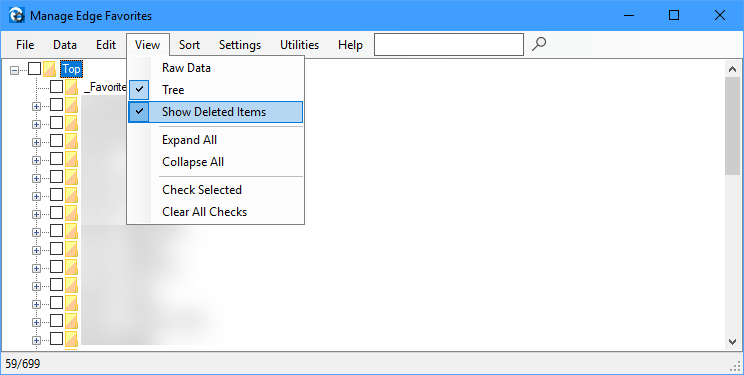 If you accidentally delete a Favourite in Edge that you didn’t mean to, opening the View menu and selecting Show Deleted Items will highlight it in the tree view of all your Favourites so that you can select, and undelete it. The Utilities menu offers easy backup and restore functionality for all of your Favourites in a file format that’s cross-compatible with other browsers, and the sort and checkbox functionality make it really straightforward to manage the Favourites you use in the Edge web browser. You can download Edge Manage from the Internet on this link.